MyBayCity.com THE WORM TURNS: Education Report Urges "Multiple Pathways"
Children's bright faces offer hopeful future for all, but only if education reforms are successful. 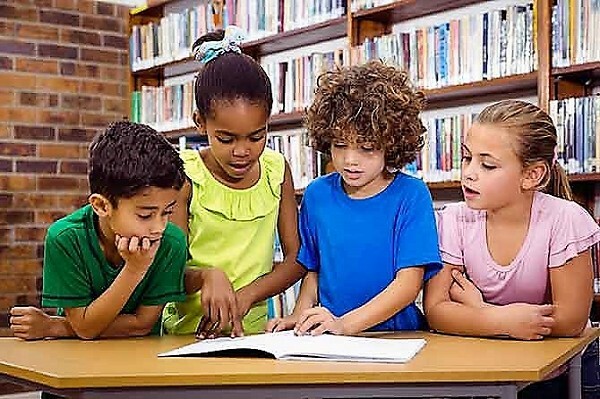 THE WORM TURNS: Education Report Urges "Multiple Pathways"
In fourth-grade reading, higher-income Michigan students rank among the worse (sic) in the country. -- 21 Century Education Commission Report. Not only did this over-reach not work, it put us farther behind. By trying to be too good, our educators forgot the human element. By pressing too hard, they showed more kids out the door. And by trying to be all things to all people, they only achieved chaos for most. Based on personal experience with students, this columnist knew those unrealistic learning goals would only deter more students from completing their schooling and add to the growing underclass that is so costly to our society. You know, welfare, one-parent 'families,' incarceration as the main alternative to education, etc., etc..
Plus, under this environment business finds itself without enough trained employees to qualify for and perform the jobs of today. Thus, the undocumented immigrant problem has grown and become a political football. Thankfully, this new report drops the glossy superlatives and hyperactive calls for higher standards and admits: "Most distressingly, we see a public education system unable to position our children to achieve the American Dream -- to do better than the generation before them. The urgency could not be greater. "A changing economy now demands that all residents earn a postsecondary education -- an education level previously reserved for a select few. The current state of our education system demands that we all participate in this transformation: from students and parents to educators, school personnel, and administrators, and to business leaders and local residents." It may be useful to reflect on how we got to the point where we are now: Remember, Russia's success with its Sputnik spacecraft in 1957 caused hysteria among the legislative and education folks; more concentration on academics is needed, they howled. Shop classes went out the door and the mandarins in robes and mortar boards swept all before them. We have long maintained that the priority for K-12 schools should be to help the student complete their schooling, (by any means possible) earn a diploma and qualify for advanced training or higher education. We now know how big a mistake it was to over-emphasize academics with stringent standards and virtually abandon hands-on, vocational oriented programs. It was YUGE! in Bernie Sanders speak. "High standards do not mean there is only one path to success. High-performing systems offer multiple pathways for students, and they work hard to ensure that the requirements at the end of one stage of education match the requirements for the beginning of the next." The report also states a verity for which it offers no solution: "We also know that too often, access to higher education is a function of family income?something that is unacceptable if our state is committed to equality of opportunity." The report amplifies: "One pathway is career and technical education and training. In high-performing systems, career and technical education have rigorous academic requirements. These programs are taught by highly trained educators, and they include apprenticeship components. Schools work closely with employers to ensure that students are well-prepared when they enter the workforce. In addition, students are educated so that they possess the academic skills to move between career education and college preparatory paths as their goals and interests evolve." The report makes some startling recommendations, including abolishing the state board of education, universal community college, and others that will be difficult to accomplish in view of legislative and bureaucratic minefields that undoubtedly will be laid down by interest groups. The Metro Times of Detroit observed: "It's unclear what, if any of these recommendations Snyder will adopt given his history of helping poor kids, particularly those who live in urban areas. The governor is also in the midst of his final two years in office and likely lacks the political capital (and/or will) to orchestrate such an overhaul. But, it appears that leaders under the inspiration of Gov. Snyder, have finally come to grips with the problem to some degree. As Pogo notably said, "we have met the enemy and he is us!" This was a very interesting piece of writing.....so where do the Betsy De Voss's fit into all these facts ?. You wrote many times regarding the "Charter Schools" corruption practices and now she is head of a department that is an Oversight for the National Education Practices Plan. Does that change Michigan's education plans? What is going to be the political platform when Snyder's term is up anyway ?. Keep Em coming !